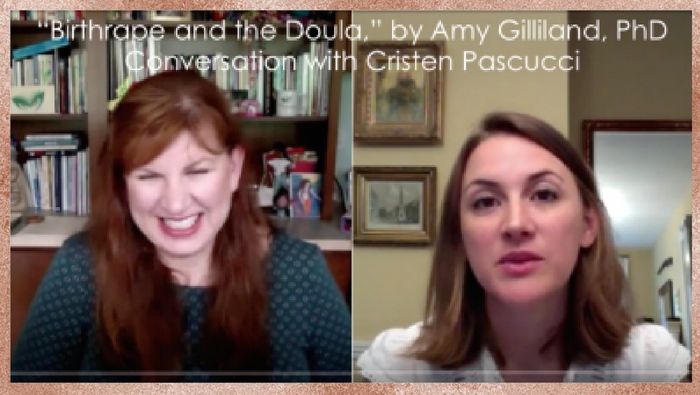 Birth Monopoly | “Birthrape & the Doula” with Amy Gilliland, Ph.D.
Two years ago, when I went around the U.S. talking about women’s rights in childbirth, I asked groups of doulas between Los Angeles and Manhattan what they wish they could tell their clients, but can’t. Over and over, the answer was: “I wish I could tell them they will probably be assaulted in childbirth.” These doulas were distraught and traumatized. They felt helpless. Imagine how their clients felt. So what does a doula do when her client is being violated right in front of her? I’ve been piecing together the answer to that question for some time now, and Amy Gilliland’s new article “Birthrape And The Doula” is her own “piecing-together” from many years of observation, firsthand experiences, and research. It’s a must-read article, and below is our conversation about the topic and her article. And coming soon: as I mention towards the end of the video, next up, I’m publishing here at Birth Monopoly a letter I wrote to a doctor about forcing a vaginal procedure on her patient. P.S. Sorry we lost the picture partway through. I’m not a technical genius. Oh, Dr Amy, I REALLY like you and what you are saying! This is helping me as I teach my doulas and student midwives, and care for my clients!